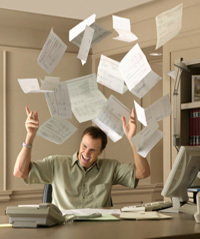 Working with Real Estate Contracts can often lead to an overwhelming amount of paper. I try to go paperless as much as possible. This week I sent an HOA package that was 160 pages with a simple link to the PDF file. My home inspectors now do their reports totally on-line (or I would consider not using them). We even transfer plats, surveys and contracts by email. Yes we are close but I still want a Paperless Real Estate Office!!! PROBLEM: Here is the problem. I still get agents who do not get it…. yet. Some are hand filling out contracts when we can now put everything on-line with Adobe. If you still have to hand write it, then scan it and send it to me. Please do not make me a copy, I just want to reduce the paper. SIGNATURES: Sure we are seeing digital signatures too, but they have not yet caught on in our area.I am looking forward to when they are accepted. I just want a Paperless Real Estate Office… am I wrong? I do too! But based on past experience: I’m about 2 – 3 years out. That’s usually about how long it takes to get other (local) agents accustomed to my way of doing business.